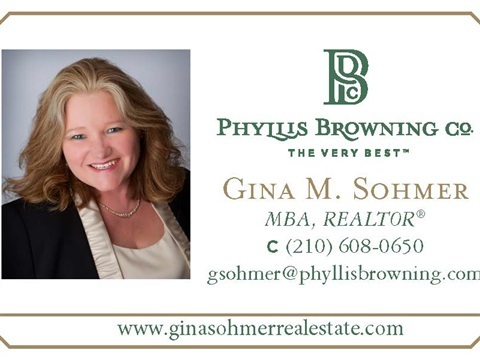 Reaching Buyer's and Seller's Throughout San Antonio! As you know since January 2017, in addition to helping buyers and sellers with their real estate needs, I have been writing a monthly real estate column for the Leon Springs Community Newspaper. As always these informational articles will always be posted here for your convenience! As you read them, don't forget to like your favorites and leave me a comment or a suggestion for a future article! I hope that you enjoy all of the information that I provide for you and I appreciate the support you provide to my local business. 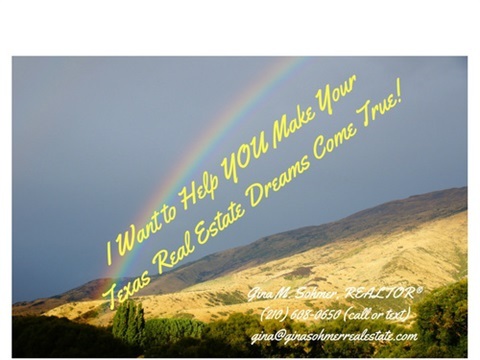 As always, if you are looking to make your real estate dreams come true - Please contact me at (210) 608-0650 when you, or anyone you know, is planning to purchase, sell, or build a home. Please recommend me on NEXTDOOR! I am also on Nextdoor, the private social network for neighborhoods. I really need your recommendations! 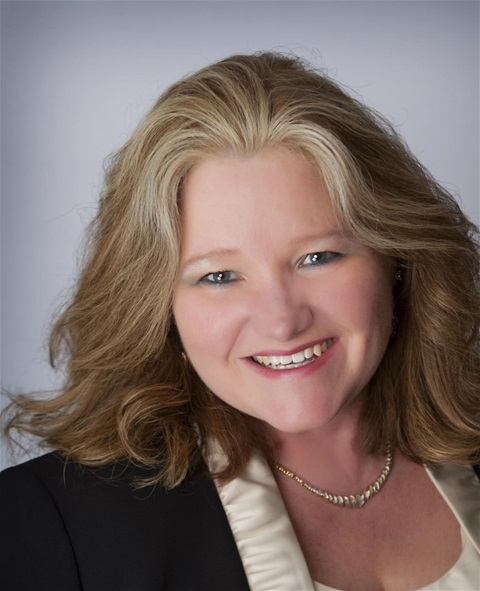 Please recommend Me to your neighbors and help me get the word out about my Real Estate Services! Thanks for being a customer of my website! I hope that you enjoy all of the information that I provide for you and I appreciate the support you provide to my local business. Please give your favorite pages a thumbs up! (like), and leave me a note or a comment. 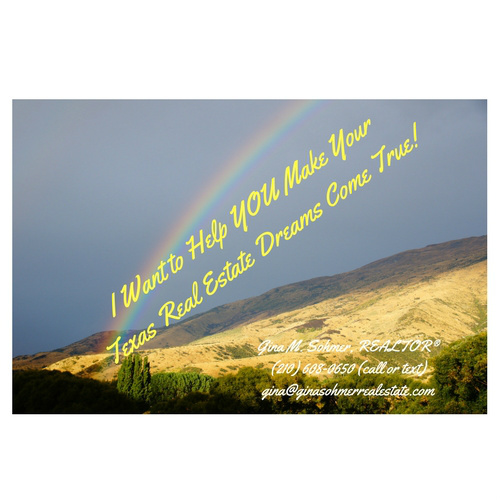 As always call me to help you realize Your Real Estate Dreams! 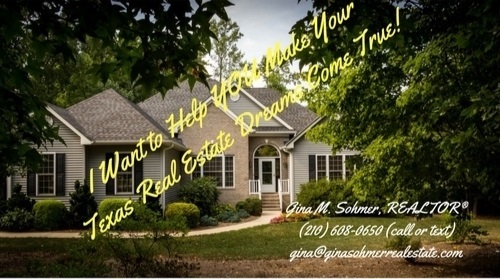 Call Gina Sohmer to Help You Sell or Buy a Home! Have you been thinking about selling your home, but don’t know where to turn for an effective real estate agent that will market your home so you can get the very best price? Not just someone who will 'list' it - and then wait for it to sell itself! Are you thinking about purchasing a home and need someone to help you find your dream home, in your perfect area? Looking for someone who can get you in touch with a responsive mortgage lender - so you know what you can afford? 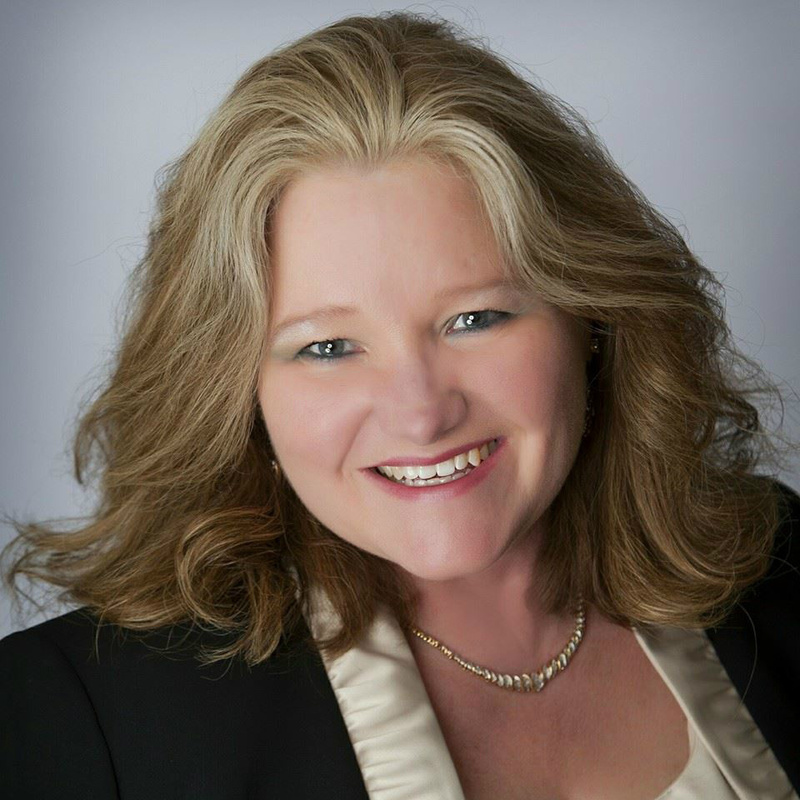 Need someone to help you to negotiate your way into living in the home of your dreams? When you are my client, I can do all of these things for you! As a professional Realtor® and former IT professional, my extensive knowledge of the real estate market and digital marketing methods, can help you or someone you know buy or sell a home! Conducting a current market value survey of your home so that we can determine the right price for a quick, and most importantly, equitable sale. Let's face it, the wrong selling price will see your home sit on the market forever and a day - the longer it sits on the market without an offer, the lower the offer price is going to be when someone does make you an offer. Professional digital photographs and virtual video tours. Digital marketing using the major Social Media platforms and major Real Estate Websites. 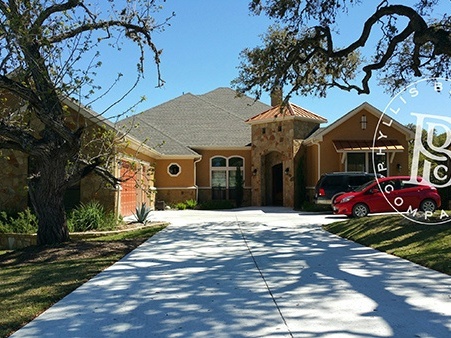 E-Marketing to more than 15000 agents in the Greater San Antonio Area. 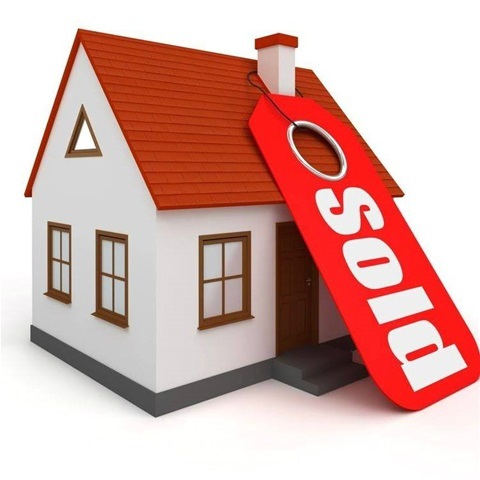 Providing you with area home sale statistics and market trends. So that when we find your dream home, you will be able to make a FAIR OFFER for the home - one that will fit with a mortgage lender's appraisal and be ACCEPTED by the Seller. If your dream home doesn't appraise for the purchase price, most lenders will not lend you funds beyond the appraisal price. This means that you would have to come up with additional out of pocket funds or back out of the deal. No one wants to pay more for a home than it is worth. Introduce you to some Great Mortgage Lenders. Who can help you determine the amount of house that you can afford and get you pre-approved for a mortgage loan. In today’s seller’s market, pre-approval is a must! Most sellers won’t accept a contract without a pre-approval letter from a lender. I also offer other tools only available from a professional real estate agent. I can offer you exclusive relocation assistance for any market in the US, and over 50 countries worldwide. I can help you get in touch with one of the more than 120,000 member agents to provide you with an exceptional real estate experience. Leading RE brokers are recognized for their agility, expertise, and superior knowledge of both local and global markets. 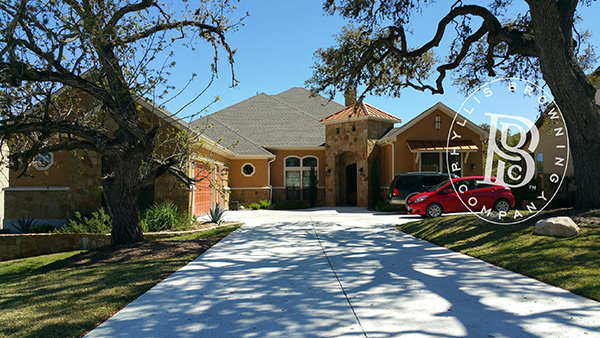 This website is for you, and in addition to providing you a free web search of homes in the Greater San Antonio Area, I will be providing some valuable information that will help you through both the buying and selling process! So click on the menus and check out the submenus above. The information is always being updated, so check back-in often, and please don't hesitate to let me know if you like something. Please go to the Guestbook submenu and say "Hi" or share some of the property postcards with your friends. I look forward to the opportunity to work with you! 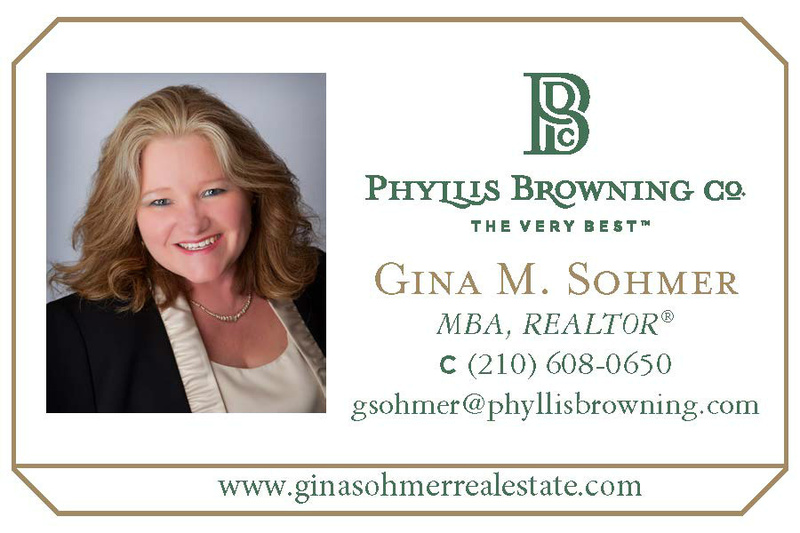 Text or call me at (210) 608-0650, or send me an email at gsohmer@phyllisbrowning.com, if you or someone you know would like more information. Thank you for allowing me this opportunity to introduce myself to you and I look forward to helping you with your real estate needs.